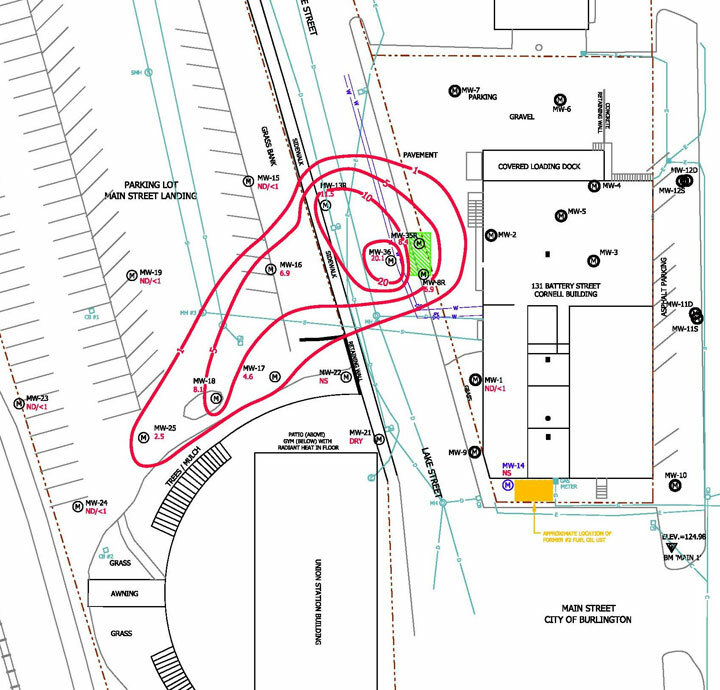 WHEM has worked since 2009 to monitor a groundwater plume of dissolved trichloroethene (TCE) beneath a former automotive maintenance facility located in close proximity to the Waterfront in Burlington. The original source of the TCE was likely engine degreaser that was released via migration through floor drains. The majority of the TCE impacted soil and groundwater is generally under asphalt and concrete. The dissolved TCE plume originates beneath the on-site building and extends beneath a roadway and to an adjoining property. While WHEM has confirmed that there is limited impact to sensitive receptors, including finding no evidence of impact to soil vapors beneath the slabs of two abutting buildings, we are continuing to work the Vermont DEC and the abutting property owner to mitigate the risk to human health and the environment. In the fall of 2015, WHEM began the implementation of its Corrective Action Plan, removing 220 tons of contaminated soil. Recent groundwater sampling efforts have revealed TCE concentrations in source area wells lower than pre-excavation concentrations. Annual groundwater monitoring is occurring, with WHEM continuously evaluating the data to determine if ISCO injections are necessary.